Managing teams requires excellent communication. Team Task Manager is the right tool to help keep track of all tasks, control time, and dramatically increase group productivity! The software can be installed and configured in minutes. The friendly user interface gets you started right away and eliminates the need for costly trainings. Team Task Manager does not require monthly fees. It’s very affordable for every budget! Team Task Manager is designed to minimize the time it takes to keep your projects up-to-date. Assign tasks, setup due dates, add task dependencies, attach files, view progress reports, share documents - all with just a few clicks. Notification alerts in the Windows taskbar give an instant feedback, the minute a change occurs. 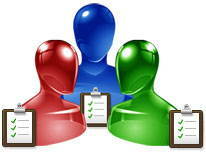 All team members can see their individual to-do list and access project details as well as share documents. Managers can easily add members, configure access privileges for each project and document, follow-up on assigned work, and much more. Team Task Manager automatically notifies team members about new tasks, informs the project manager of completed work and sends out reminders for overdue items. Projects with many tasks and team members can quickly get overwhelming to handle. Team Task Manager improves the overview by offering different project views. Besides the familiar tree structure, project tasks can also be viewed in a graphical Gantt chart format. Project reports can be reviewed by team members and a burn down chart is displayed with the remaining work. Team Task Manager includes a document sharing feature that can securely control the viewing, editing and deleting the critical information, independent of the team members' access to the file server. Sharing up-to-date information with everyone in the team gets easier when critical information is stored and secured in a central place. 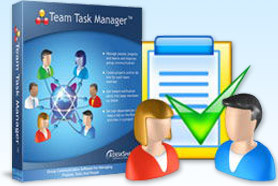 The Team Task Manager database can be installed on any PC and does not require Internet connectivity. All team members inside the LAN can access the data by simply installing the lightweight Windows client application. Since the database is not stored on the Internet, it’s easier to prevent unauthorized access to the confidential information. Team members that are geographically dispersed can get secure access to the Team Task Manager database if the network administrator configures the LAN for remote access. Download the FREE trial version! It is 100% safe! So what are you waiting for? Download Now! This is a great way to manage tasks and keep all our team members on their toes! Thanks for a great tool. Subscribe to our newsletter for new product releases, critical updates, and special offers. Copyright © DeskShare Incorporated. All rights reserved.